Disclosure : This post contains affiliate links. Click here to know more. I love Thai food ! It is not surprising as many of the Thai flavors were the ones I grew up with. Rice, spice and coconut were part of our daily diet. 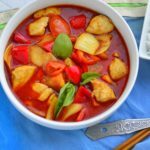 The Thai red curry with shrimp reminds me of the fiery red fish curry – two very different curries made with coconut , chilies and seafood. Both are yum and delicious !!! Truth is often times home made Thai food is restricted to pad thai or thai chicken noodle soup. 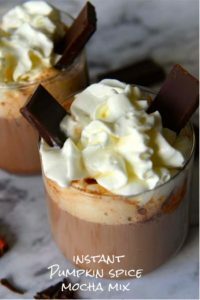 The reason is simple these 2 are absolutely delicious and my kids favorites and on busy weeks their bellies often rule the kitchen. Coming back to the red curry, I remember our first foray into Thai food. To us the spice scale of 1 to 10 seemed quite tame, after all where we had navigated ‘gun powder’ and ’40 chili chutney’ quite successfully. So AJ confidently told our waiter “Make it 10” ! . The polite waiter gave us another chance to get out of it , but we were too naive … Suffice to say that we burned for the next 10 days ! Lesson learnt, but not quite ! We occasionally venture to an 8 or 9 when in an extremely adventurous mood but usually sticks to a tame 5 or lower. Often times I wonder how Adam Richmond’s insides survived. The point is go for a mild curry paste. 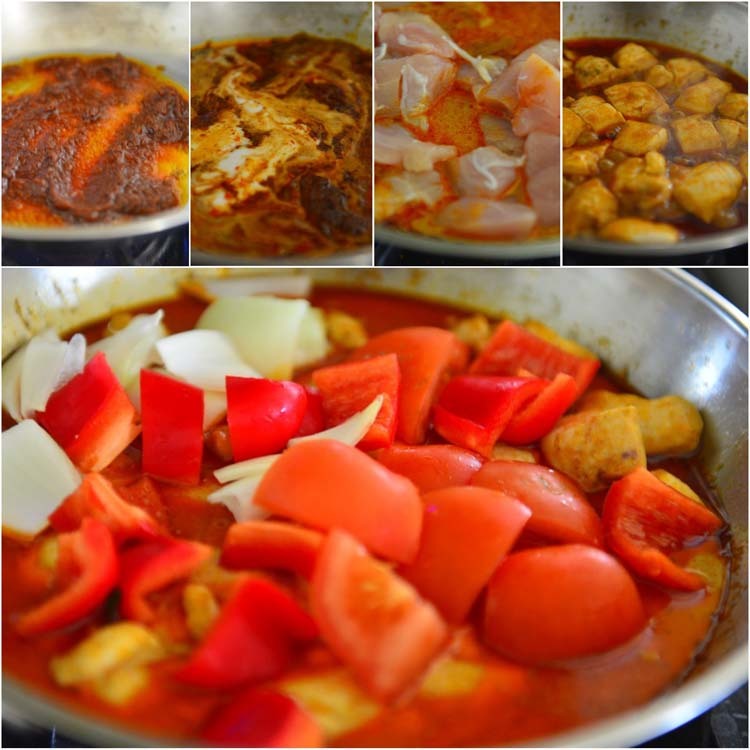 About the curry paste – no , I do not make red curry paste from scratch. Many of the ingredients are not available in the markets here. I am guilty of reaching for prepackaged and I like the red curry paste by Thai Kitchen. I have come across other brands in the Asian markets, but there is a reason why I prefer this . It is vegan. Which is good for me especially when we are entertaining vegetarian/vegan friends. With a jar of curry paste in the pantry it is quite easy to make a delicious dinner in under 30 minutes. Usually a small jar is good for 2 dinners in our home . You can make this vegetarian , vegan , or add your favorite meat or seafood to it. This curry is one of the easiest – no need to hunt for fresh lemon grass or kafir lime leaves in this one. But the Thai flavors are very much there. The curry paste packs such a punch, you would not miss the extra flavorings. To me fish sauce is an integral part of the Thai flavors. You only need a dash of it , but if that is not something you like, feel free to leave it out. On a side note I there are no green veggies in this – some crazy part of my brain kept blurting out “keep it red , keep it red”. And honestly it tasted grate without green! That being said some fresh spinach or snow peas would have been lovely here as well! 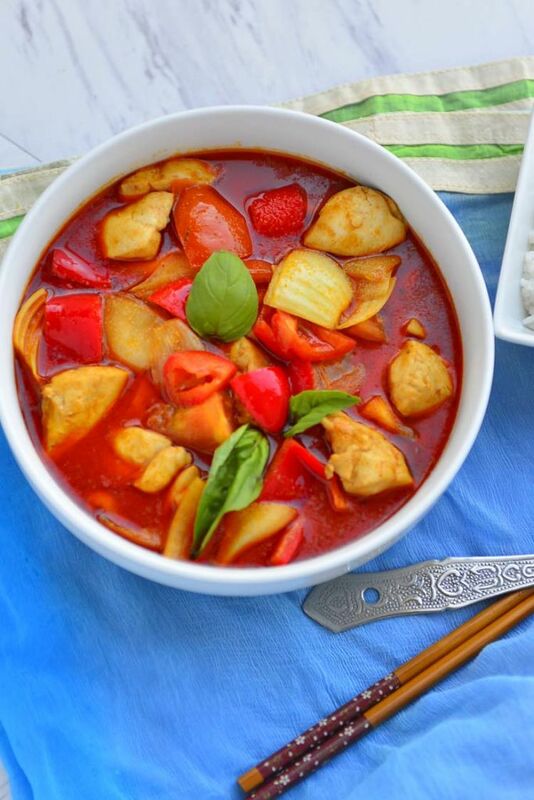 This delicious Thai red curry is the easiest t make. It all comes together in under 30 minutes that too in a skillet ! 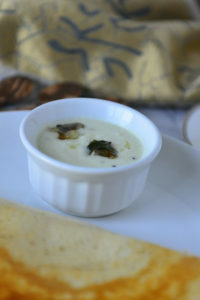 The flavors of coconut milk and spices are perfect to be served with a bowl of steamed rice! Cut the chicken into bite size pieces. Dice the onions and bell pepper into 1 inch squares and cut the tomato into 8 pieces. Heat oil in a skillet. When hot add the spice paste and stir fry for about a minute. Add 1 C coconut milk and cook over low heat until it begins to simmer and the oil raises up to the top. Add the meat , cover and cook for about 5 minutes. Remove the lid and check if the meat is done . If needed cook for additional 2 minutes. Add the remaining coconut milk to taste. Stir in the fish sauce, if using. Stir and add the vegetables. Cover and bring it back to a low boil . Turn off the heat. Let it mellow for 5 to 10 minutes before serving. You could substitute milk for coconut milk. Boneless skinless chicken breasts or jumbo shrimp are best for this curry. Other vegetables that works well here are - snow peas, button mushrooms, sliced carrots , water chestnuts, and fresh spinach.